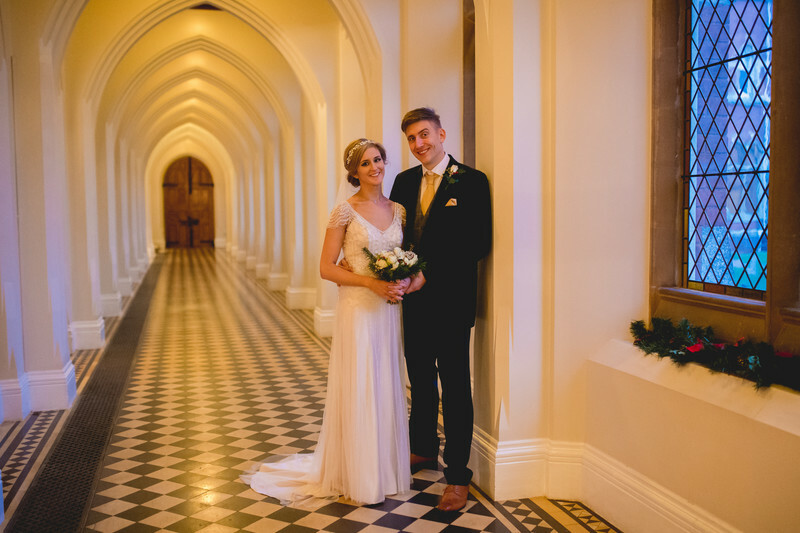 A bride and groom pose in the cloisters of Stanbrook Abbey after their wedding. Nicola and Alex got married just before Christmas in Stanbrook Abbey in Worcestershire, which is one of my favourite wedding venues and one that I've worked at many times. Plus you can see it from my house, so it's a nice local venue to me! I love shooting weddings at Stanbrook Abbey, it's a vast, expansive wedding venue that has just about everything a bride and groom could ask from a wedding venue. The Callow Hall is stunning and a wonderful place for wedding ceremonies. From there, there's the piano bar at the old front entrance, or George's bar at the new front entrance, as well as formal gardens, open lawns and a lake with a lovers' swing too. Oddly though, for me, Stanbrook Abbey really comes to life as the sun goes down. As Nicola and Alex's wedding was so late in the year, we started to lose daylight at around 3:30pm - meaning we could get to taking the after-dark photo earlier! 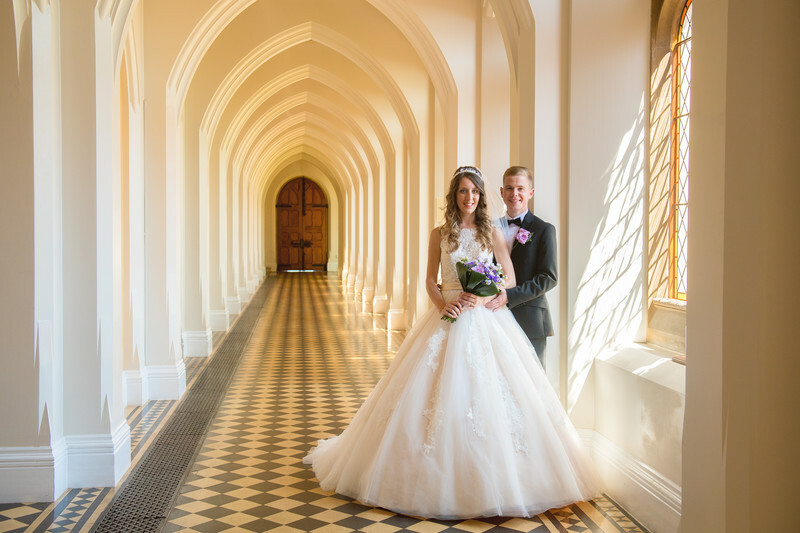 One great location for photos in Stanbrook Abbey, be it in daylight or night time, is the cloisters, which you can see here in the main image. The ambiance completely changes between the day time and the evening, as does the warmth of the light. The artificial light is really warm and gives a lovely tone to images, whereas the midday sun provides a cooler light but with more contrast. Have a look at the comparison with the image below, taken in the middle of summer. 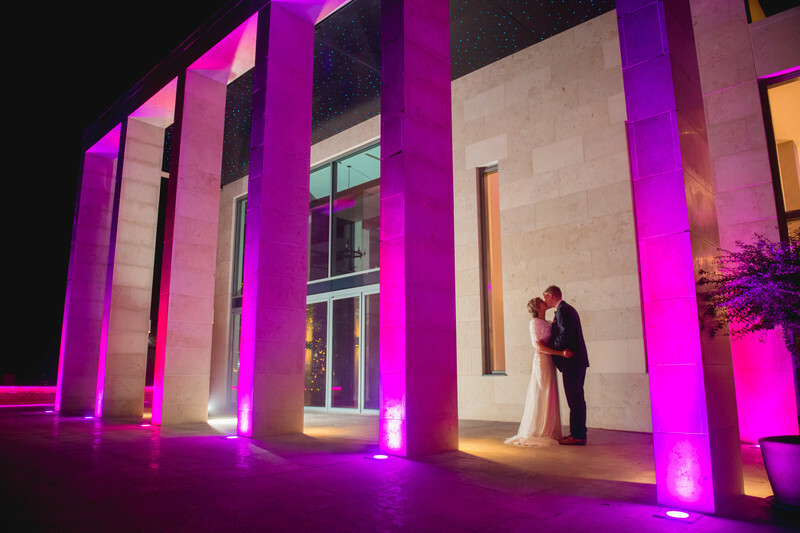 One of my favourite locations at Stanbrook Abbey for stunning wedding photos is the new front entrance. I make the distinction between old and new, as for the years couple of years I worked at the venue, the front entrance, and only way into the building, was through the set of double wooden doors you see in the background of both images. More recently, George's Bar has opened (it would be behind me as I was taking these photos) and that forms both the new front entrance, and once the sun goes down, one of my hot-spots for photography.